The gender pay gap is closing in Wales – helped by an increase in women moving into roles traditionally associated with men. Swansea Bay Business Life met some pioneering women in industries ranging from construction to financial services to making whisky, to ask them about this challenging but changing landscape. Describe your job/role now, what it involves and how long you have been doing it? “I am currently working as a contracts manager for The Premier Group. I have been doing this role for around two years, having previously worked on smaller reactive maintenance and planned maintenance projects as a maintenance and small projects manager. I have been fortunate enough to be given the opportunity to grow within the company and develop into new roles. When I first started in 2010 I worked in administration and then moved quickly over to maintenance, assisting in managing a team of handymen based all across the UK. “During my time at The Premier Group I have worked in all areas from health and safety to procurement. This has given me an understanding of all aspects of the business, which enables me to support the work we do on-site. “I studied sociology and criminology in university and as a career I had thought about going into the police or working with the rehabilitation of offenders, so this wasn’t a direct career path. However I have managed to use skills developed in university in the construction industry. In your view, is your job traditionally more associated with men? Are you aware of this? Has it ever bothered you? Are you seeing more women entering your profession now? Is there anything preventing that happening? “My job is definitely more traditionally associated with men but there are more and more women working in this industry and I have worked alongside many women in a project manager role who work for our clients. It isn’t something I am so aware of so much anymore. I am aware it is a more male dominated industry. I would like to say it has never negatively affected me but that isn’t true, but I do believe it is changing. Is there anything you would like to see happen to encourage more women into the type of job you do? “Additional training opportunities, specifically for young women targeting not just training in construction skills or project managing but also training on how to manage difficult situations with men on site. Similar to the push that women in engineering has received, I think women in construction in general could do with a bit more attention and overall awareness. “I am fully aware that my job is more traditionally associated with men, especially within the timber frames sector. However, instead of bothering me, it has simply made me more passionate to make changes in the industry. I have a strong character, and I think it’s important that we have the capacity for different perspectives in any business. In my role at Seven Oaks Modular especially, I make sure to think about each obstacle in a different way to my colleagues, in a way you could call it ‘the female touch’. What was your career path before this? How did you end up in this role? In your view, is your job traditionally more associated with men? Are you aware of this? Has it ever bothered you? Are you seeing more women entering your profession now? Is there anything preventing that happening? “I think the first step would be to have more women as role models. In London, there are a lot of women being represented on TV and gaining visibility as speakers in the financial sector. I would like to think that this would encourage not just adult women, but also children to think about it as a future career. South Wales has several huge platforms with spectacular reach – seeing more female financial professionals on BBC Wales, WalesOnline and the whole host of business targeted media that we have in this country would make a significant impact. “I have a BSc (Hons) degree in forensic science with criminology from the University of Glamorgan – lots of maths, physics and chemistry. But the whisky industry is far more exciting and much less messy than crime scenes. How did you come to work for Penderyn? “I joined Penderyn in early 2012, fresh from university, as a trainee distiller. I knew very little about the whisky industry prior to joining the company and my position was actually advertised anonymously in order to avoid well-meaning and excited (but unqualified) enthusiasts applying. At the interview our chief executive revealed the true position, then went on to ask ‘Do you know much about whisky?’. When I responded that I didn’t, he quickly followed with ‘Well, this is Dr Jim Swan, one of the leading whisky experts in the world – I’ll leave you both to it for a while’. For the next hour or so Dr Swan took me through a fairly comprehensive nose and taste test to determine if I had the ability to conduct sensory assessments on our new make spirit, maturing spirit and finished products. I could barely speak I was so nervous but thankfully Jim saw some potential and went on to become my mentor for the next five years. What brings you the most job satisfaction? 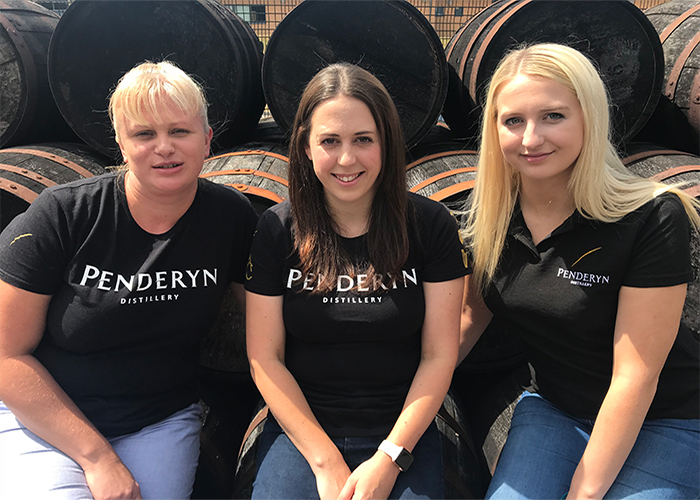 “Overseeing our process from malt intake to spirit draw and assessing that spirit to be to the Penderyn standard – knowing that at every stage of the process we’ve had quality at the forefront of everything we do. My role has a great balance between the technical and very hands-on distillery operations work and the brand ambassador work – getting out and about to host whisky dinners, meet customers at trade and consumer shows, engage with business visitors and VIPs etc., which makes every day a little different. I also feel very privileged to have had the opportunity to train under Dr Jim Swan for several years and see this as one of the things I’m most proud of from my time at Penderyn. Finally, being part of two commissioning phases (from our distillery expansions in 2013 and 2014) was a great experience and gave me a huge amount of job satisfaction. What advice would you give to someone wanting to become a distiller? “Be prepared to get stuck in and get your hands dirty. Be passionate about every aspect of everything you do, and remember that the best results don’t always come from textbooks but from experience and experimentation – don’t be afraid to think for yourself. There are public facing events, tasting and masterclasses and this can involve a lot of travel which I enjoy but you have to be prepared to get stuck in to the detail of the day-to-day at the distillery, which is where you can really make a difference to the quality of the product.